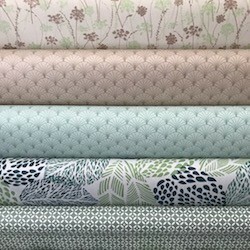 Fleur de Soleil, it's also a practical, joyful and colourful linen office. 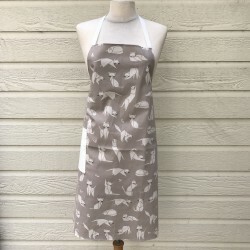 Discover our aprons for men and aprons for women available in coated cotton to cook without staining, to take care of plants without getting wet or for the manual activities for the little ones with our children apron. 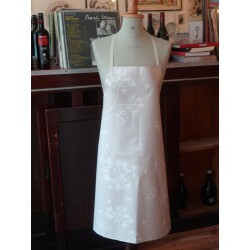 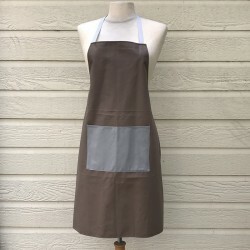 Dimension: 27x 31inNeck strap: 19 inTie strap: 2 x 21inMaterial: Coated cotton, anti-stain and waterproof100 % Made in France Apron Astrancia beige coated cotton exists in one size. 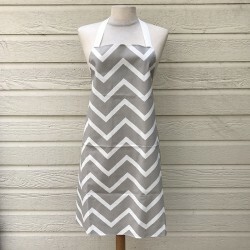 Dimension: 27x 31inNeck strap: 19 inTie strap: 2 x 21inMaterial: Coated cotton, anti-stain and waterproof100 % Made in France Apron Herringbone beige coated cotton exists in one size. 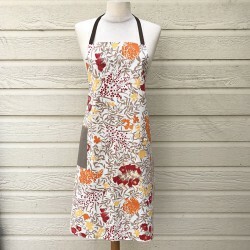 Dimension: 27x 31inNeck strap: 19 inTie strap: 2 x 21inMaterial: Coated cotton, anti-stain and waterproof100 % Made in France Apron Camellia orange coated cotton exists in one size. 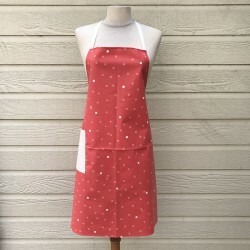 Dimension: 27x 31inNeck strap: 19 inTie strap: 2 x 21inMaterial: Coated cotton, anti-stain and waterproof100 % Made in France Apron Mimosa red coated cotton exists in one size and has a right side pocket. 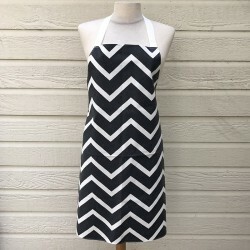 Dimension: 27x 31inNeck strap: 19 inTie strap: 2 x 21inMaterial: Coated cotton, anti-stain and waterproof100 % Made in France Apron Herringbone black coated cotton exists in one size. 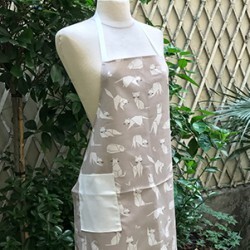 Dimension: 27x 31inNeck strap: 19 inTie strap: 2 x 21inMaterial: Coated cotton, anti-stain and waterproof100 % Made in France Apron Cats taupe coated cotton exists in one size and has a right side pocket. 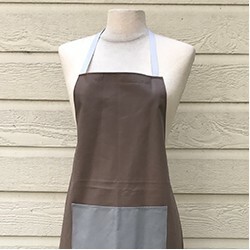 Dimension: 27x 31inNeck strap: 19 inTie strap: 2 x 21inMaterial: Coated cotton, anti-stain and waterproof100 % Made in France Apron Plein taupe coated cotton exists in one size and has a spacious front pocket. 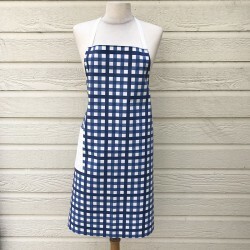 Dimension: 27x 31inNeck strap: 19 inTie strap: 2 x 21inMaterial: Coated cotton, anti-stain and waterproof100 % Made in France Apron Gingham blue coated cotton exists in one size and has a right side pocket. Dimension: 27x 31inNeck strap: 19 inTie strap: 2 x 21inMaterial: Coated cotton, anti-stain and waterproof100 % Made in France Apron Gingham red coated cotton exists in one size and has a right side pocket. 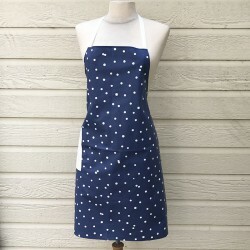 Dimension: 27x 31inNeck strap: 19 inTie strap: 2 x 21inMaterial: Coated cotton, anti-stain and waterproof100 % Made in France Apron Confetti blue navy coated cotton exists in one size and has a right side pocket. 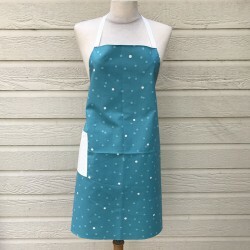 Dimension: 27x 31inNeck strap: 19 inTie strap: 2 x 21inMaterial: Coated cotton, anti-stain and waterproof100 % Made in France Apron Confetti turquoise coated cotton exists in one size and has a right side pocket. 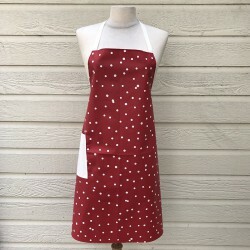 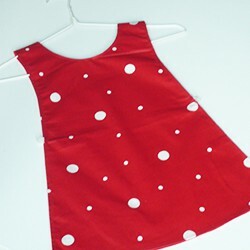 Dimension: 27x 31inNeck strap: 19 inTie strap: 2 x 21inMaterial: Coated cotton, anti-stain and waterproof100 % Made in France Apron Confetti rouge coated cotton exists in one size and has a right side pocket. 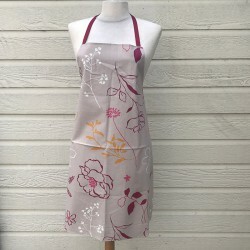 Dimension: 27x 31inNeck strap: 19 inTie strap: 2 x 21inMaterial: Coated cotton, anti-stain and waterproof100 % Made in France Apron Confetti coral pink coated cotton exists in one size and has a right side pocket. 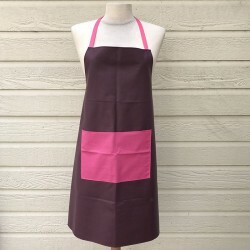 Dimension: 27x 31inNeck strap: 19 inTie strap: 2 x 21inMaterial: Coated cotton, anti-stain and waterproof100 % Made in France Apron Plein plum coated cotton exists in one size and has a spacious front pocket.